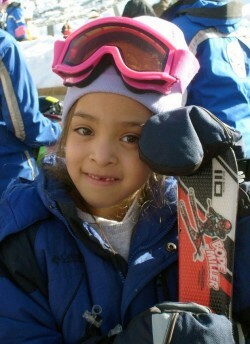 A youngster enjoying the snowy learning experience of SOS. To be surrounded by snow and brilliant blue skies while kids race down the beautiful Colorado slopes, their scarves flying, their faces lit with joy and flushed with exercise—this makes SOS Outreach very close to my heart. And now that the organization provides children with summer programs as well, like camping, hiking, and mountain biking, I applaud their vision for the youngsters. I love skiing in the beautiful winters and running in the warm summers in Colorado. Bringing this healthy lifestyle to underprivileged kids makes SOS very special. We first discovered SOS through the Colorado River Ride in 2007. Here was this great charity group that was providing after school athletic activities like snowboarding and skiing to build character and self-esteem in underserved children. The next year we found out more about their programs—and we knew that this was something that we, as the Take The Magic Step team, should support. And we have been so happy to see it grow over the years! SOS believes in many of the same principals as Take The Magic Step. The organization uses playful exercise in a team setting to help children accelerate their learning and social skills; it is a leadership program to improve their chances to succeed in their lives. What could be better? Kids playing outdoors, being healthy—and learning at the same time! We share their love of playful exercise! Come and join us for a great time together with the children of SOS Outreach! Take The Magic Step Foundation is happy to call SOS Outreach (“SOS”) our charity partner! SOS Outreach began as the Snowboard Outreach Society in 1993 in order to introduce underprivileged youth to the mountains through snowboarding. Now, more than 20 years later, SOS has grown in numbers, expanded across many different individual sports in winter and summer, and incorporated a youth development, leadership training, and adult mentorship curriculum into its programs. 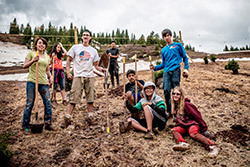 In 2009, SOS finalized a merger with Meet the Wilderness, an organization that taught life skills, teamwork, and leadership to youth through summer activities. The merger ensured that the organization could provide year-round leadership development programs. SOS offers outdoor activities including snowboarding, skiing, backpacking, camping, hiking, rock climbing, and mountain biking. Each of these adventure sports is designed to foster self-confidence and self-respect, cultivate life skills, and demonstrate to students the importance of giving back to the community. SOS Outreach bases its programs on the theory that participants can effectively connect learned skills in nature and outdoor sports to their own lives. As a part of the program, youth are mentored by adult volunteers from the community who help participants understand and practice the SOS core values (courage, discipline, integrity, wisdom, compassion, and humility), give back to the community, and learn values-based leadership skills. During the 2015/2016 winter season SOS served 3,526 underserved youth for 18,669 total program days (an increase of 8% over last winter). 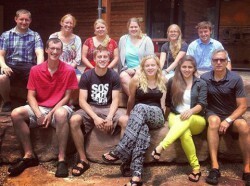 SOS also successfully launched a pilot program in Park City, Utah. In addition, the organization is on pace to serve 965 youths through their summer wilderness expeditions and camping trips. SOS’ target population includes underserved youth aged 8-18 who face a variety of risk factors, including low-income backgrounds, English as a second language, single-parent households, low self-esteem, and lack of physical activity. 69% of participants self-identify as an ethnic minority. 66% of participants reported having a household income of less than $40,000 per year. 53% of participants had no health insurance or were enrolled in Medicaid. 43% of participants live in situations other than two parent households. Gender: 56% Male, 44% Female. Each SOS participant is given the opportunity to learn how to make better choices and live a more productive life through a series of courses that reflect SOS’s extensive research in recreation, coaching, character education, adult mentorship, civic & community engagement, and leadership & vocational skills training. The overall goal of these courses is to increase self-esteem and positive participation within the community while introducing healthy lifestyle choices. To learn more about SOS Outreach, a 501(c)(3) organization, please visit www.SOSOutreach.org. Read more about the Colorado River Ride with updates from the 2009 event. You can find more information on the Colorado River Ride 2010 here, and on the ride in 2014, Thank You to the Children and Students of SOS Outreach. © Copyright 2008-2018 by Uta Pippig and Take The Magic Step®. All Rights Reserved.